The acoustic guitar has its place in almost every style of contemporary music. So how can you use the processing tools of SX to help find the right place in your mix for all that strumming and picking? Cuts centred at 100-300Hz and 1-3kHz can help if the sound is a little boomy or needs to be more open and transparent. Adding a few dBs around 5-7kHz can add a little presence. There can be very few instruments whose use is as ubiquitous as the acoustic guitar. In almost all branches of contemporary popular music — from folk through to heavy rock — acoustic guitars have their place. While there have been some dramatic improvements in sample-based 'virtual' acoustic guitar instruments during recent times, even a half-decent guitarist is likely to produce a more realistic performance by playing the part. Using Q to roll off the lows and add a little high-end sparkle makes a good basic starting point for acoustic guitars in a full mix. However, the performance is not everything — the recording also has to be a good sonic fit to the musical piece as a whole. So, what can Cubase SX offer if you are looking to get the perfect, hand-crafted acoustic guitar part into your mix? Clearly, different sounds are needed for different uses, and the likely processing choices will depend upon whether the acoustic guitar is being used for accompaniment, as a rhythmic element or as a featured (solo) instrument. As with many mixing questions, frequency balance and level are the key issues — so it is no surprise that the focus is on EQ and compression. However, before considering the tools SX offers for the post-recording (mixing) processing that might be applied to acoustic guitars, some brief comments on the recording process itself might be worthwhile. 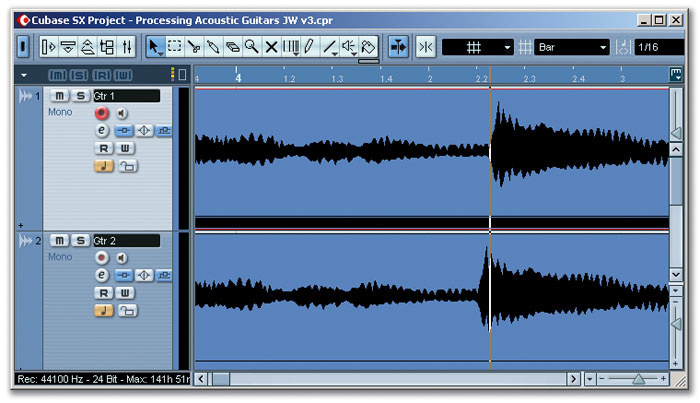 Back in the August 2001 issue of SOS, Paul White (with a little input from Mike Senior) produced a very useful technique column called 'Recording Acoustic Guitar'. In the main, this focused upon the recording process itself, rather than the subsequent processing that might be applied while mixing. Paul and Hugh Robjohns also produced a video tutorial on the same topic that appeared on SOS DVD2 (with the November 2005 issue of SOS). It covered issues such as microphone choice, microphone placement and stereo recording. Interested readers can read the original article, so there is no need for me to repeat the excellent guidance already given. However, it is worth emphasising one key issue that comes out of these guides. As mentioned above, within a mix, acoustic guitars are often shaped tonally in a way that would perhaps sound unnatural if heard in isolation. However, it is very difficult to pre-judge what will be required prior to the mixing stage. Therefore, when recording parts, the best method is to go with the most natural reproduction of the guitar sound that your instrument, recording room and equipment (mic/preamp) allow. Keep any EQ processing to a minimum and change the recorded sound of the guitar via mic positioning, if possible. If compression is required while tracking, then keep it gentle. By sticking to these basic guidelines, the recorded track should be a faithful reflection of the performance with a well-balanced frequency response. If your mix does then require you to radically cut, or perhaps more subtly enhance, particular frequency bands then fine; with a well-balanced original recording, free from over-compression, you will be keeping all your mixing options open. If the guitar is being used as a featured instrument — perhaps a solo guitar or a solo guitar accompaniment to a lead vocal — then the guitar sound will probably need to be left as natural as possible. 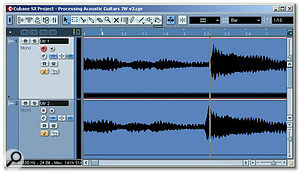 If the recording process has been well done, then little or no further processing may be required — perhaps a subtle EQ cut in the dominant frequency range occupied by the lead vocal (the SX Spectrum Analyser, from the Audio menu, can be used to help identify where this might be) and a little gentle compression will be all that is required. Go easy on the compression. In this example, a gentle 2:1 ratio is being applied above a -15dB threshold to only catch the peaks.Things can get a little more tricky when a place for the acoustic guitar has to be found within a more complex mix. EQ can be used to shape the tonal balance of the guitar part so that a suitable balance is achieved between giving the guitar part its own space within the mix and making sure that it does not tread upon the frequencies required by other instruments. Compression can help even out the dynamics of the guitar part to ensure it neither gets lost in a busy mix nor that it overpowers other elements of the arrangement. My personal preference is to place EQ first in the signal chain and then drive the compressor with only the guitar frequencies that are going to be important within the mix, but there are no fixed rules here and so some experimentation is often required. Whether you use the standard SX channel EQ or the four-band Q plug-in (from the Filter group of the SX plug-in list), there are a few fairly standard EQ adjustments that can form a good starting point for acoustic guitars. In a full mix, perhaps featuring drums, bass guitar, some keyboard parts, vocals and possibly some electric guitars, there are going to be plenty of other instruments that are competing for space (and carrying the power) in the lower end of the frequency range. Cutting some of the bottom end below 100Hz thins out the acoustic guitar sound a little and, if there is plenty of kick drum, bass guitar or powerful electric guitar present, all these frequencies in the acoustic guitar track will do is make things a little muddy. If the part needs to cut through a mix more clearly, a little extra 'sparkle' can be applied by boosting by a few dB above 10kHz. This does need to be done with some care, however, as it can give the sound a little too much sizzle if overdone, creating a very unnatural result, even within a full mix. The Multiband Compressor can be used to control both tonal balance and dynamics. In this example, the gain of the various bands is used to roll off the lower frequencies and boost the upper two bands for presence and sparkle.Between these low-end and high-end extremes, there are three other frequency ranges that are commonly worth experimenting with. First, if the guitar sounds a little boomy (perhaps a little too much soundhole in the microphone positioning during recording? ), sweeping a parametric band from Q through the 100-300 Hz range may help identify where the problem lies. Once the offending frequency is identified (and this may depended upon both the guitar and the part being played), it can be gently cut by 2-3 dB to reduce the problem. Second, applying a cut within the mid-range can help to make the sound a little more open and transparent. Again, sweeping one of Q 's parametric bands through the 1-3 kHz range will soon identify whether this helps or not. Finally, a modest EQ boost somewhere in the 5-7 kHz range can add a little presence to the sound. In some cases, this may be preferable to the high-end sizzle added above 10kHz, especially if there is also plenty of high-frequency energy provided by the various cymbals within the drum track. While the combination of these EQ changes may, in isolation, make the acoustic guitar part sound a little weedy and perhaps a touch too bright, it is likely to sit much better within a busy mix, while occupying less space. Until you become more confident in your ability to judge these sorts of EQ changes, plenty of A/B comparisons are needed, both with the EQ applied and bypassed and also with the guitar soloed and heard within the context of the full mix. Again, unless the guitar is the featured instrument, it needs to work within the mix rather than in isolation, and in this context, a 'natural' sound may not be what is required. It is quite difficult to give very specific advice about suitable compression settings for acoustic guitar when mixing — the details will depend upon both what the role of the guitar part is within the mix and the style of the part played. However, it is probably true to say that the more exposed the guitar part is, the more subtle the compression needs to be in order to maintain a natural dynamic to the performance. With SX 's Dynamics plug-in, it is probably worth starting with a fairly gentle 2:1 ratio setting and adjusting the threshold downwards until gain reduction is only really being applied to the peaks of the performance rather than continuously. 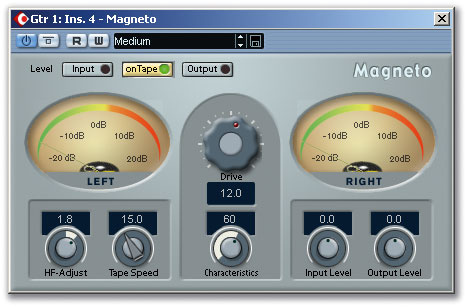 Magneto can be a useful alternative to standard compression. It can also be useful to warm up a DI recording made via the guitar's built-in pickup.In terms of attack times, a setting somewhere between 10 and 20 ms provides a decent starting point. Some care is needed with really fast attack times — while they will control the level more severely, they can also rob the attack of each note or chord strum of its natural character, resulting in a very weak and lifeless sound. For most acoustic guitar material, I've always found that the Auto Release function of Dynamics does a decent job, but if you do feel the need to set this manually, be guided by the tempo of the material — with up-tempo strumming, a longer release time may mean that the compressor has not fully released by the time the next strum occurs, which might have the unwanted result of reducing the impact of the attack of each strum. An alternative approach to controlling the dynamics of a strummed guitar part is suggested in the 'Something Fishy' box. 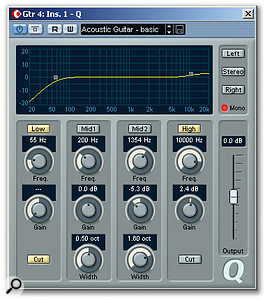 Another possibility when mixing is to replace the Q and Dynamics plug-ins with the Multiband Compressor. As I outlined in the May 2006 issue when looking at basic mastering within SX, this plug-in can be thought of as both a dynamics control and, by adjusting the gain settings for the particular frequency bands, also provide some control over the tonal balance. 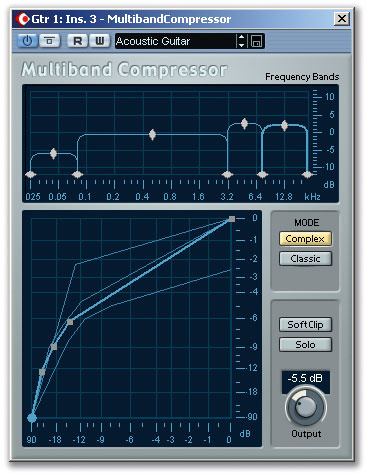 Multiband Compressor includes a preset for acoustic guitar which forms a decent starting point but, as with mastering, the number of bands, band gain and frequency range can all be adjusted to taste. In essence, the same basic guidance described above applies here. For example, if the guitar part has to sit in a full mix, reduce the gain on the lowest band to roll off some of the low-end. Equally, a little presence or high end sparkle can be added by increasing the gain of bands centred about 6kHz and 12-14 kHz respectively. Multiband Compressor does, however, have a down side — it doesn't provide any detailed control over attack and release times — and with some performance styles, this lack of control is a distinct disadvantage. Duplicating a track, offsetting the original relative to the copy and then panning left and right can create the impression of a tightly double-tracked performance.As an alternative to overcooking the EQ controls, another approach is to insert the Magneto plug-in on to an acoustic guitar track. By adding a little tape emulation you can give the track some added warmth, some 'tape' compression and, by tweaking the HF Adjust setting, add a little top-end zing. This can work well with some material, but be careful when applying it to rapidly strummed chords as, in my experience, it tends to squash the chord attacks if overdone — a little goes a long way. A further trick when mixing a strummed guitar part is to make a duplicate track from your mono recording, pan them to opposite sides of the stereo image and then slightly offset the timing of one track relative to the other. This can create the impression of a tightly played double-tracked guitar part and can result in a very wide stereo image — not necessarily very 'natural', but this is not a major consideration in most pop music styles. 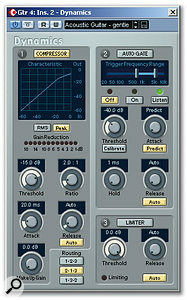 The impression can be further enhanced by applying very slightly different EQ and compression settings to each track. As with any 'man-made' manipulation of the stereo image, however, it is always worth ensuring that the mix still works in mono. Roomworks may not be the most sophisticated sounding reverb plug-in available, but some of the presets work well with acoustic guitar. Depending upon how closely miked the original recording was and the acoustics of the recording room, the final touch of magic might be some additional reverb. Unless the part is a slowly played solo guitar piece, less is definitely more when it comes to acoustic guitars. Roomworks offers a number of presets that can be adapted to work well enough in this role. For example, for a tighter, ambience-only sound, the 'Room Roomour' preset combines a short pre-delay and short decay, while a more spacious sound (without going over the top) is provided by the 'Plate Vintage' preset. Given the various processing options discussed here, it is worth repeating the comment made earlier — start by making the most natural and faithful recording of your acoustic guitar performance that you possibly can. The processing options in SX can only achieve so much during mixing and you are much more likely to achieve the required result if you can gently chisel away at elements of a full, even recording. If you find you are trying to apply corrective processing to add something that isn't present in the original recording or remove something that shouldn't have been recorded in the first place, it is probably time to get the microphone out again and go for another take! The excellent Floorfish expander/noise gate plug-in — it's free and not at all fishy! In the August 2001 'Recording Acoustic Guitar' article mentioned in the main text, Mike Senior describes how a gate or expander could be used to bring out the rhythmic element of a strummed acoustic guitar by letting the main attack portion of each strum through but then quickly 'ducking' the level of the sound between strums. The Auto Gate section of SX 's Dynamics plug-in doesn't really help with this effect (the gate is either fully open or fully closed). 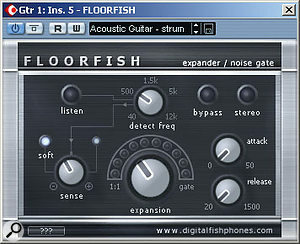 However, the Floorfish VST plug-in does offer this capability and is well worth checking out. Floorfish is available free from DigitalFishPhones (www.digitalfishphones.com) within their 'Fish Fillets Channel Insert Package', a bundle that includes Blockfish (a decent compressor) and the wonderfully named Spitfish (a de-esser). And, no, I've no idea why the programmers are so obsessed with fish!